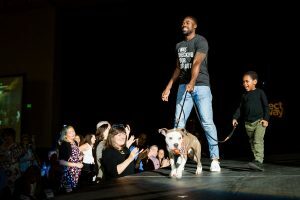 Pawject Runway is the hippest fashion show on four paws featuring a five-star lineup of Show Your Soft Side’s Big Softies “modeling” adoptable cats and dogs from the Baltimore Animal Rescue and Care Shelter (BARCS). Tickets to Pawject Runway are $35 when purchased online at pawjectrunway.org now through Friday, April 26 at 11:59 p.m. EST After that time, online ticket sales and sales at the door will increase to $45 for general admission. Food and drinks available that evening for purchase. Click here for a behind-the-scenes glimpse of what the night entails. If you’d like to lock in a sponsorship for 2019, email gro.edistfosruoywohsnull@ofni.